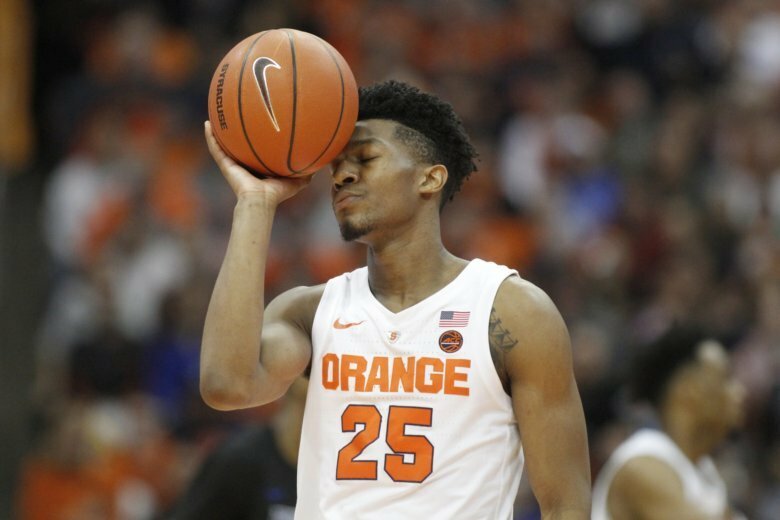 SYRACUSE, N.Y. (AP) — His head covered by a hoodie to help shield his emotions after a second straight home loss, Syracuse point guard Frank Howard could barely be heard as he responded to questions about what went wrong. And that was in a locker room where one could have heard a pin drop. “It’s concerning. It’s something we didn’t deal with at all last year,” Howard, a senior, said in the aftermath of the Orange’s 12-point loss in the Carrier Dome to No. 14 Buffalo on Tuesday night . “It’s going to hurt. We just got punched in the mouth. Not difficult to understand that sentiment. Picked No. 16 in the AP preseason poll, likely on the strength of all five starters returning from last year’s Sweet 16 squad, the Orange (7-4) look lost. After losing its fourth nonconference game — just the fourth time that’s happened in Jim Boeheim’s 43-year tenure as head coach at his alma mater — Syracuse doesn’t have long to figure things out because Atlantic Coast Conference play begins in less than three weeks. Boeheim has seen this show before. “Our record is what you are,” he said. “It’s not what people thought we could be or hoped we could be or think we could be. This is what we are. The Orange were hurt by preseason injuries to all three point guards on the roster, most notably Howard’s lower-left leg problems that forced him to miss the first four games. He had a season-high 13 points against Buffalo, but he only notched one assist and had three turnovers. As a team, the Orange finished with seven assists and 16 turnovers and were dominated on the boards 48-35 by the more intense Bulls, 29-17 in the decisive second half when Syracuse scored just 23 points. The struggles were evident early in the second half. In a span of less than 3 minutes, forward Oshae Brissett missed a layup, a dunk and a jumper, Elijah Hughes misfired on a 3, and Tyus Battle also missed a jumper. Also glaring has been the Orange’s performance at the free throw line. They missed 12 in a six-point loss Saturday to Old Dominion and against the Bulls misfired on the front end of three 1-and-1s and finished 5 of 13 from the line. The Bulls are unbeaten after 11 games in large part because they hustle on every possession. They defeated a team they hadn’t beaten since 1963 despite shooting just 37.1 percent (23 of 62) and hitting only 10 of 33 from beyond the 3-point arc. That they missed their first eight shots of the game didn’t faze them one bit. Puzzling, too, was the performance of Battle, the team’s leading scorer. When he unleashed a driving, windmill slam dunk midway through the first half, it gave Syracuse a nine-point lead and energized the crowd. But the junior had only one other basket in the period and his 3-pointer that tied the score at 53-all with just over 8 minutes left in the game was only his second shot of the second half. He finished 4-of-10 shooting for 11 points, his third-worst showing of the season and 7.5 points under his average. “They were just denying me the ball the whole time,” Battle said. “I should have done a better job, made something happen. I wasn’t even close to doing enough. Syracuse didn’t make the NCAA Tournament the other three times it lost four nonconference games — 1982, 2015, and 2017. It’s still early this time around, but time’s a flitting.